Ok, who are they....the Four Hallyu Wave Emperors ??? See for yourselves in the pix above !! EEEEKK....I haven't stopped squealing....Kim Hyun Joong is going to be in the same show as Jang Keun Suk !! OH....my two favorite boys !!! [BYJ's a man !! and he is THE Ultimate Emperor of The Hallyu Wave]. 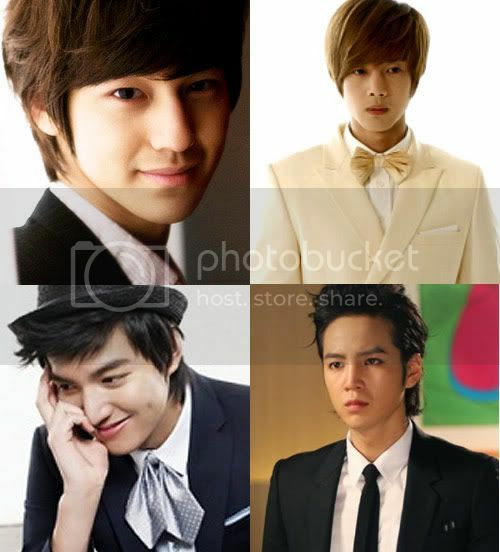 Lee Min Ho and Kim Bum's there too....Oh ! F3 + Sukkie !! This Chuseok Special Program will be broadcast on September 22 at 8 pm by SBS E! TV.My goodness !! Thanks also to :Ladymoon at twssg.blogspot.com and Shiro401 at Soompi forum JKS thread.